Under the Electric Sky, we come together to celebrate life, love, art, and music. From the stages and the sound to the pyrotechnics and the performers, so many unique elements go into bringing this world to life. We invite you to wander, explore, interact, and connect. Imagination and positive energy are the currency of this place. Each area contained within EDC represents a distinct union of technology and nature, where elements mix to ignite the senses and inspire the imagination. We groove to the same universal beat and, together, create beautiful experiences that will never be forgotten. 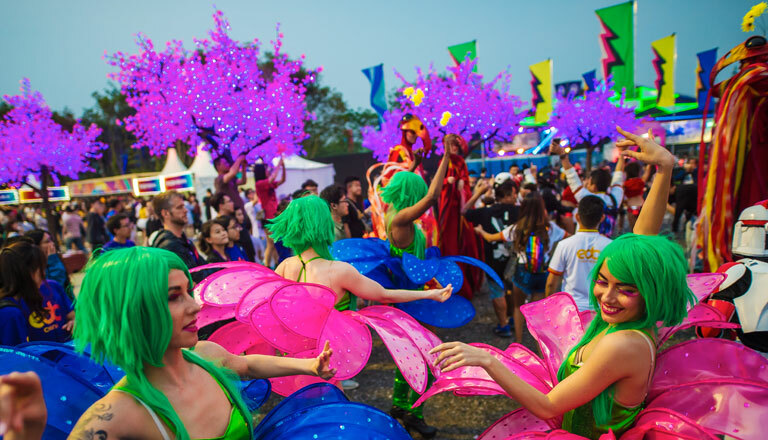 Meet our merry bands of Funkdafied Freaks—the dancers, stilters, aerialists, circus performers, and other whimsical characters of EDC! Decked out in over-the-top costumes crafted specially for Insomniac, this motley crew will enchant you, astound you, and play with you all night long. In this place, we affirm that we are kindred spirits bound by deep passion—not only for the music we love, but for the community that surrounds it. That community is why we are here. You are the heart of EDC. YOU are the Headliner.